(Nanowerk News) Twisting a screwdriver, removing a bottle cap, and peeling a banana are just a few simple tasks that are tricky to pull off single-handedly. Now a new wrist-mounted robot can provide a helping hand — or rather, fingers. 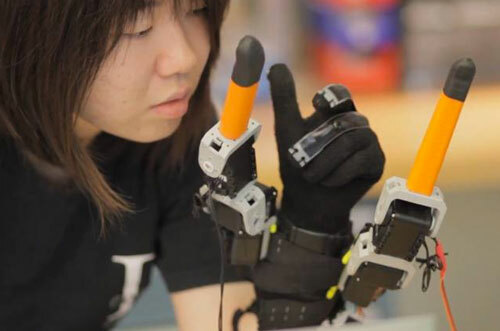 Faye Wu, a graduate student in mechanical engineering, demonstrates the "supernumerary robotic fingers" device.